(1 of 10) Main Street Hero– This award recognizes one outstanding community leader or public figure who has displayed an involved commitment to downtown and his or her Main Street program. Through her professional role with the MS Department of Archives and History and her commitment to serve her hometown of Starkville, Michelle Jones has served in many leadership capacities in the Starkville community. As Past Chairman of the Starkville Convention and Visitors Bureau, Michelle was instrumental in her role to partner with Mississippi Main Street to provide Starkville with a path for transformation of the Downtown area. Following Starkville’s designation as a certified MS Main Street Community in 2010, Michelle joined the Executive Board, later serving two terms as Chairman, a seat she currently holds today. Michelle also serves as a member of the Mississippi Main Street Board of Directors and can be found across the state working with communities to preserve their rich history. For more than 10 years, Michelle has advocated to keep Starkville’s history intact while continually striving to take the steps to move the community forward. One of downtown Vicksburg’s advocates and one of its strongest ties to the city’s business community is Mayor George Flaggs, Jr. Mayor Flaggs works hard to encourage the revitalization of downtown and its retail heart. He also works to enhance the city’s focus on our majestic neighbor, the Mississippi River, while ensuring that it is managed with sustainability. Mayor Flaggs has dedicated much of his time to advocating for the interests of downtown businesses, residents, nonprofits and government agencies. He understands that a vibrant downtown is a critical part of a healthy city. During his time as mayor, Mayor Flaggs has worked to continue the revitalization of Vicksburg’s historic downtown and increase citizenship along with creating new jobs and more opportunities for our entire community. Premier Partner– recognizes creative joint ventures between the Main Street organization and another local, community entity or entities (public or private). The number one economic development tool in Senatobia, MS is Northwest Community College. One of the county’s largest employers, the largest tax revenue generator, and home to over 2,500 students, Northwest has plenty to offer the community, but for years, Senatobia has struggled to bridge the gap between the college students, faculty and the community. This year, Senatobia Main Street reached out to Northwest for help in several areas and was blown away with their enthusiasm. The Career Tech Graphic Art Department recently helped with a complete festival rebrand. The students received real life learning experience by dealing with sponsors and building a brand as well as being able to showcase their artistic talents. This was a win-win situation for both Northwest and Senatobia Main Street. The art for the festival has never looked better or had a more consistent brand image and the students received real life experience. The invaluable new partnership has strengthened the Senatobia community as a whole. Outstanding Creative Fundraiser– This award is granted to the downtown organization that has displayed the most creativity and success in securing funds for its downtown program or specific project. Cleveland Bites Food Festival is an annual event that was created in 2014. This event was created as a partnership between Team Cleveland and Keep Cleveland Boring as a way to bring together all of the area restaurants so that they could showcase their menu items to participants. Cleveland Bites allows area restaurants to hand out sample size portions of their most popular or newest menu items to participants. This event has been held in the alley next to Mosquito Burrito and at the Delta Arts Alliance Annex Building. Every year more than 25 restaurants are featured as well as live music from local artists. More than 200 people attend this event. Team Cleveland Main Street charges $15 per person and all proceeds go toward Team Cleveland’s façade grant program. In the last 4 years this event has provided 10 façade grants of $500 each to Team Cleveland Main Street Members. Outstanding Marketing– This award recognizes excellence in overall marketing by a downtown organization through its integrated communications efforts, including traditional and digital marketing. A great Main Street event or festival is nothing without a strong marketing campaign to help promote it. After 5 years of building the Que on the Yazoo event, 2017 was our year to put a strong focus on integrating and boosting our marketing game plan. With the help of Hammons and Associates, Main Street Greenwood was able to develop a marketing plan that included Facebook, Instagram, Twitter, radio, a modified website, an e-newsletter and television ads. Innovative taglines, posts, and clever hashtags such as “Swooning over Swine”, “Que up the Tunes”, and #howdoyouque combined with images from the event, streamlined our marketing approach into a cohesive brand that was promoted over all platforms. The results of our efforts were crystal clear. 2017 was the best-attended event yet and the media analytics were then used for 2018 to obtain the most sponsorship money for any Main Street event to date. Outstanding Community Education Campaign (1 of 2)– This award recognizes excellence in a targeted campaign that educates the community about a streamlined effort to raise awareness on a particular aspect of a Main Street program. Walk into history and immerse yourself in the ever-evolving life of downtown Vicksburg by touring Vicksburg’s newest outdoor “museum”, the Vicksburg Heritage Walking Trails. The Vicksburg Heritage Walking Trails allows visitors to immerse themselves in the history of Vicksburg by strolling five different routes featuring 35 markers placed throughout the downtown and historic districts. The National Park Service’s Lower Delta Initiative Grant and the City of Vicksburg fund the Vicksburg Heritage Trails Network Project. The project was implemented by the City of Vicksburg, Vicksburg National Military Park, Vicksburg Convention and Visitors Bureau, Vicksburg Main Street, Old Court House Museum, Gordon Cotton, David Maggio, Morgan Gates- Principal Tours and the Vicksburg-Warren County Chamber of Commerce Community Fund. There is no way to replicate the beautiful heritage, history and culture of Vicksburg. Visitors and locals alike are able to learn the important attributes that Vicksburg has to the history of the Civil War and also learn that our story goes far beyond that. Plans of work and creative juices run dry after a few years on any job and our project organization at Main Street Greenwood was no exception! In the summer of 2017, it became clear we needed to re-organize our plan of work and ensure we were aligning projects with the visions of our community. With no real precedent on how to achieve this, we created the How Downtown Visioning Process. A survey link was shared with community members with 5 questions allowing them to express their concerns or issues with downtown. The results were tallied and organized into talking points on HOW we could achieve change in downtown and then discussed during the How Downtown Community meeting. The process was so well received that over 50 community members attended and provided real, tangible ideas, goals and objectives for Main Street to pursue over the course of the next 5 years. Former Chief of Police and now City Manager since 2011, Jim Luke believes forming Partnerships with groups such as Picayune Main Street, the Chamber of Commerce, Foundations, Churches, Scouts, and local civic organizations is essential to city growth and development which is evident in the City of Picayune, MS. Jim’s unique vision and ability have led him to directly spearhead and/or support city workers, local and government agencies and local organizations in activities and programs leading to specific accomplishments like the New City Hall Complex, beautification projects, infrastructure and safety improvements in roads, sidewalks, city lighting and signage, and the restoration of city parks and substantial funding through grants and donations. Jim is dedicated to preserving Picayune’s history but he always has an eye toward the future. His vision, partnership building, “ can do” attitude and care for citizens make Jim Luke a true standout among all the Heroes of Picayune. There are people who are dedicated volunteers and passionate advocates for their towns. They are at almost every event and are valued. You give them awards to show your appreciation and thank them constantly for their service. Then, there are people who have been there since the beginning, are at every event, and you never get the opportunity to thank them because, if you did, you would never be able to stop. There are people without whom the success of the organization is immediately called into question. That, ladies and gentlemen, is Mallorie Rasberry –Wife, mother, accountant, and fierce advocate for Downtown Laurel, Mississippi. When it comes to service with Laurel Main Street, Mallorie has done it all, including the early mornings and late nights. When thinking about her hard work, what else can we call her besides Laurel Main Street’s Hero? Outstanding Creative Event (1 of 2)– This award recognizes the downtown organization that has created a quality creative event, generating traffic for the downtown. In 2017, Tupelo Main Street partnered with the Tupelo Convention and Visitors’ Bureau to turn its annual Wine Downtown event into a sustainable, marketable event that could be offered for incoming conferences in order to enhance the visitor experience. By scaling down operations and adding a shopping tournament to further economic impact, the partner organizations’ created the Mini Wine Downtown and Shopping Tournament. Tupelo Main Street has been able to use this event twice since then, and from a combined 4 hours of shopping time we have seen an economic impact of over $6,500 back into downtown, as well as fantastic merchant feedback and excitement about this event in the future. For a Main Street Community, this contribution is truly immeasurable. Twice a year, Hattiesburlesque puts on a new show with a live band at the Thirsty Hippo in downtown Hattiesburg. Each show has grown bigger than the one before it, selling out earlier and earlier. This must-see, can’t-miss event brings together the arts community in a giant celebration of everything that makes Hattiesburg beautiful and unique. From original costumes and set design, to the live band, to the incorporation of all forms of dance, to comedy, to on-site art creation, Hattiesburlesque incorporates it all in the spirit of “art makes art makes art.” While it is an eclectic display of the Hattiesburg arts community, it is also an empowering celebration of the women of Hattiesburg. Outstanding Retail Promotion– This award honors the downtown organization that has developed an effective retail promotion(s) in conjunction with downtown merchants. When a four-legged vagabond becomes downtown Greenwood’s icon, one Main Street organization couldn’t help but create a retail promotion around his reputation. Sit, Stay, Play Greenwood was based upon #HowardStreetHoward, a dachshund mix who evaded capture for 6 months and stole the heart of every Greenwood resident. After finally finding a home with Greenwood’s CVB director, Howard became the face of Greenwood Main Street’s retail event in August, which is a slow time for downtown Greenwood retailers. Downtown shoppers who made a purchase during the month of August were given an entry into the Sit, Stay, Play Sweepstakes, which included a night at The Alluvian and a Viking Cooking School class. At the end of the event, Main Street Greenwood entered 200 new contacts into our database for future promotional events, reached over 2000 per social media post, boosted August sales tax, and utilized profits made off Sit, Stay, Play t-shirts. Outstanding Image Promotion (1 of 2)– This award recognizes the downtown organization or business that has developed an effective public relations piece or specific promotional campaign. “We are the entrepreneurs, the architects, the chefs, and attorneys that work in your downtown. We’re the artists, bankers, engineers, and realtors - the faces of your Main Street. We’re the baristas, City employees, mechanics, and volunteers who invest in our community every day. Each of us has a story...Meet us on Main Street and become part of the story.” Thus began a promotional campaign to feature the faces of Main Street Clinton. An ongoing campaign, Meet Me on Main Street seeks to grow engagement by highlighting the individuals who invest in the Clinton community. The campaign began with a large group photo, representing the vital partnership among those whose shared ambition is to provide the best possible community experience. Subsequent ads showcase one individual – a business owner or volunteer or City employee with a short bio. Ads appear in The Clinton Courier and on social media. Not a day goes by that we do not watch or experience some form of video or video promotion in our day-to-day activities, especially on our social media accounts. As part of downtown Greenwood’s visioning process, How Downtown, local community members expressed the need of having a downtown promotional video. Main Street Greenwood jumped on this idea and began working with local film producer, Matthew Moore. The goal of the video was to showcase all the culinary, retail and residential amenities we currently have, how far we have come in terms of preservation and the direction we are going in terms of continued downtown re-development. To fund the video, local companies committed $100 to the project and have their company featured in the credit reel at the end. The video was a 6-month process but managed to capture the true essence of downtown Greenwood. This award will solidify what we already know, Penny Hawks Frazier IS Senatobia Main Street’s Hero. Penny has served the Senatobia community tirelessly in multiple capacities. She served as a Senatobia alderwoman for six years and served on the Tate County Economic Development Foundation board of Directors from 2010-2017. She was one of the driving forces behind the rebirth of the Senatobia Main Street program in 2013, serving on the Senatobia Main Street board from 2013-2017, with two terms as its president. Penny, a downtown property and business owner, has been an unwavering supporter of Senatobia’s downtown revitalization and was instrumental in the hiring of the first Main Street director. She was chairman of the inaugural Five Star City Fest in 2014, establishing a blueprint for the successful festivals that followed. Penny Frazier not only talks the Senatobia Main Street talk, she walks the Senatobia Main Street walk with the best of them. The Hernando Main Street Chamber of Commerce is very grateful to have Dawn Edwards involved in the Hernando community. Dawn has lived in the Historic District for 28 years and has been involved with Hernando Main Street for the past 16 years. Dawn has served as a Board member for Hernando Main Street from 2002 to 2006 and from 2013 to 2018. She served as President in 2017 and is currently serving as Past-President. In 2017, Dawn went above and beyond her duties as a Board President. In 2017 alone, she volunteered a minimum of 75 hours at Hernando Main Street sponsored events. For the annual Water Tower Festival, Dawn was found volunteering at 7:00am with Arts & Crafts check-in and didn’t leave until 12:00am when the last band finished packing up. Dawn has also been the Silent Auction Chair for Taste of Hernando for six years, and she is known for decorating Hernando for Christmas for the past 10 years. Outstanding Rehabilitation Project– This award is granted to an individual or business that has completed an outstanding historic rehabilitation project that continues the use of the building. The 1940 Art Moderne Starkville Armory was built for the local unit that was called to active duty before building completion. It was adapted for City Hall, Municipal Court and the Police Department. Over 60 years, these functions outgrew the building, as the interior was remodeled, reacting to current, pressing needs. In 2015, the City focused on the Police Department needs and made the significant choice to rehabilitate this local historic landmark rather than build a new building outside the downtown area. The Armory rehabilitation restored the original proscenium and stage. Original house lights were rehung, and doors and windows were restored. The barrel-vault roof structure was uncovered and heavy timber construction exposed and restored. The City of Starkville re-investment in the Armory was $4,478,000. The dedication of the City of Starkville, Starkville Police Department and their design team Shafer, Zahner and Zahner to restore this building as a landmark with modern functionality and provides public use for another generation. Outstanding Public Improvement Project (1 of 2)– This award is given to the municipality or Main Street program that has designed and implemented attractive and sympathetic improvements for its district. The Crosby Commons Project was nearly 5 years in the making, involving a host of partnerships including City Officials, local organizations, regional foundations, and many others. It is a 5-acre, fenced-in community green space located on Goodyear Boulevard in Historic Downtown Picayune. A 1/3-mile paved walking track, benches and tables, historic markers, flowerbeds, trees and shrubbery, a 2,430 sq. ft. amphitheater (with restrooms and changing rooms), sound systems and speakers throughout the park, and lighting around the track for nighttime use and utility hook-ups for mobile vendors are featured amenities. Citizens and visitors enjoy the park for exercise and relaxation and the park has been used by hundreds for larger venues. Funding came mainly through donations, foundation grants and donated labor. The park offers local citizens and visitors expanded opportunities for fitness, healthy recreation and a safe, secure area for community building. A 2011 ARC-MMSA Charrette for Starkville Main Street encouraged growth of the Downtown District toward the Cotton District and MSU, recommending infrastructure improvements, creating connections and establishing a strong Downtown entrance. The City of Starkville embraced the Russell Street Plan and Neel Schaffer developed incremental plans to transform the corridor. In 2015, MSU received MDOT funding using FHWA’s Transportation Alternatives Program to improve the Plan with bike paths and enhanced pedestrian connectivity. MDOT addressed safety issues at Russell Street and Highway 12 including connectivity to a pedestrian bridge on University Drive that created an entrance to Downtown and connected the District and MSU. The Russell Street Boulevard opened the 2017 MSU Football season, enticing townspeople to walk toward the campus and alumni and visitors to walk downtown. This Plan involved federal, state, and local partners contributing $2.7 million, encouraging private investment of $69 million, and embodies what making connections within a Downtown can mean. Outstanding Visual Merchandising– This award recognizes excellence in visual merchandising in a retail business in a Main Street district. The Lucky Rabbit is a once-a-month variety shop, specializing in vintage items, upcycled and handmade goods, gifts, home decor and Hattiesburg related merchandise. By having a once-a-month strategy on an otherwise low traffic street in the downtown area, the Lucky Rabbit is able to bring close to 10,000 people to Hattiesburg in four days. Abby and Brandon Thaxton strive each month to bring a new visual and interactive experience. They focus on a different visual theme, where the front window display, front main display, online promotion, booth themes, and t-shirt designs all correspond. Each theme is carried out down to the last detail, but the store seems to reinvent itself again the next month. The displays have featured sand, dirt, 20' Christmas trees, bikes and umbrellas hanging from the rafters, old trucks, and anything else imaginable to make The Lucky Rabbit not just a store, but a retail shopping destination and experience. Outstanding New Development- Granted to an individual or business that has undertaken a new development project within a downtown district. Brothers Steven and Chad Brady have a thriving Lenny’s sub shop in Pascagoula but have now ventured into the full-scale restaurant market. Brady’s Steak and Seafood has opened its doors, nestled into a part of the City that is near Round Island Lighthouse and Lighthouse Park, along the banks of the Pascagoula River and only walking distance from the downtown district. The restaurant is built 12 feet off the ground with a spectacular view. Brady’s is accessible by boat, kayak, and vehicle and serves grilled and fried seafood and the best Pascagoula Prime Steak you can find. The restaurant has a meeting room that seats up to 20 people, a bar area, outside seating, and an amazing river view experience. The Brady brothers’ total investment in the restaurant is $1.7 million and employs more than 30 people. Pascagoula is fortunate to have the Brady’s invest their money, time, and talent into the community. When it comes to service to Cleveland, Becky Nowell has made her mark! In addition to serving as Cleveland’s first lady, Becky serves on many boards including: Team Cleveland, Chamber, GRAMMY Museum MS President, Crosstie Arts Council, and many more. In 2017 Becky’s best friend Lucy Janoush passed away. As a tribute to Lucy’s love of Christmas, Becky put together a committee and set out to raise money to purchase holiday decorations to display downtown. In a few months, Becky raised over $250,000. In fact, not a single business told Becky no! Becky’s idea for adding new lights to downtown Cleveland blossomed into an event called 50 Nights of Lights. As a result of Becky’s hard work, thousands of visitors streamed into Cleveland over the holidays, providing a huge economic boost for our local merchants. Bob Luke is impressive in mind, body and spirit. An accomplished architect and community leader, Bob Luke has over 30 years of professional experience. A native of Philadelphia, Mississippi, Bob has operated his practice in Meridian, Mississippi, since 1987. He is currently the managing principal of the Meridian office, with offices in Columbus, Mississippi, and Topeka, Kansas. As a principal of the firm, he is responsible for project management and execution of major projects. His architectural talents are not limited to Meridian but have been demonstrated throughout the state and beyond. Any project that he decides to support will be a successful project because he fully engages, commits and sacrifices to ensure everything is finished with complete satisfaction for all involved. Bob’s talent is undeniable. His community leadership cannot be matched. He’s an architect by choice but to Meridian Main Street, Mississippi Main Street and anyone lucky enough to know him, he’s the definition of a hero. Outstanding Adaptive Reuse Project– This award is granted to the best adaptive reuse of a building that has outlived its former use. Laurel Main Street Executive Director, Judi Holifield, used to say that rehabilitating the Burton’s building would be the ultimate domino effect; all of the other buildings along Magnolia Street would be sold if only that one could be. Josh Nowell bought the building and breathed new life into it. The historic character of the building was preserved, including the vintage sign, while new businesses were allowed to make their own mark on it. It is currently full with two retail stores, a coworking space, and the offices for an engineering firm, and a restaurant. The best part is that Judi Holifield was right, and Magnolia Street is now filled with businesses. Outstanding Economic Impact– granted to an individual, business or municipality (or partnership of entities) that has undertaken a new development project within a downtown district. One of downtown Vicksburg’s newest additions to the growing restaurant and bar scene is Cottonwood Public House. This brewpub located in the heart of downtown Vicksburg serves craft ingredients to customers in a casual environment. Cottonwood Public House serves up a mixture of locally brewed beer, craft pizza, and casual dining while also providing residents of downtown a place to feel a sense of community. The name “Public House” was included in the name because that is what owner Tim Cantwell intends this place to be. Both tourists and locals are making their way to this local spot, and this business has created 15 full time jobs. The sense of community and local atmosphere has made this place easily become a favorite “go to” for locals and tourists alike. This is exactly what Cottonwood Public House was intended and designed to provide. Outstanding New Business– granted to a new business in a downtown district that contributes to excellence in downtown revitalization. The Steel Forest Furniture Company, owned by Chip & Maureen Gerber, made its home in historic downtown Columbus in September of 2016, joining Columbus Main Street even before its opening date. Their new and extended location, on 5th Street South, opened just in time for Wassail Fest in December of 2017. With over triple the amount of display space, it immediately became quite a showplace. Chip has also been very community-friendly, donating two fabulous custom steel benches in downtown Columbus, each boasting the Columbus Main Street logo. Steel Forest Furniture Co. was featured in Log Home Living Magazine in March of 2018, bringing further recognition to the downtown Columbus area. When the Columbus Police Department needed a donation for a statewide gathering, Steel Forest was quick to provide a beautiful steel flag with a blue line, signifying a commitment to protect. This outstanding new business is always ready to assist the Columbus community! Outstanding Community Transformation (1 of 2)– This is an overall award that goes to a Main Street program that has achieved a successful, preservation-based downtown revival. How do you bring a town back? It’s a question that has no easy answers, and the answers that are given usually require years and more work than one might ever imagine. However, for Downtown Laurel, there is no question that the town has been revived in a powerful way. A stream of dedicated volunteers has made possible a vibrant town full of creative and passionate people. Over a dozen new businesses have opened in the past two years, and more are on the way; vacant buildings are now the exception rather than the rule. LMS is at the center of a web of transformation, where local business doesn’t just survive; it thrives. Water Valley’s cumulative economic numbers for the last decade as a Main Street program are strong. For a town of 3,500 ….90 new jobs, 27 new businesses, and 35 buildings renovated, along with $10 million in private investment.... have changed the trajectory of the town. The result is a dramatic positive transformation. And the effort has been noticed; The New York Times, Wall Street Journal, US News and World Report, Food&Wine, Die Zeit, Preservation Magazine, Oprah, Southern Living and others have all written about the comeback. This preservation-driven transformation is seen in the physical rehabilitation of Main Street’s structures. But more than the buildings being fixed, there are people back in them. Downtown is once again the center of economic and social life. The true transformation is in the attitude on Main Street. That this place matters again. That this small-town in Mississippi can once again be a good place to live in and not a place to leave behind. That is the Valley now. It is often stated that random acts of kindness have a way of changing the world, and the staff of Main Street Columbus have been privileged with seeing this change first hand. Doug Pellum of Zachary's Restaurant and his staff in downtown Columbus are a perfect example of genuine support, kindheartedness and positivity. Every facet of Zachary's presence is based on building relationships and giving back with delicious food, donations, or fundraisers. Doug wanted charity and generosity to be a major component of the restaurant's culture. His fundraising efforts have drawn hundreds of people to downtown Columbus, and he is always very supportive of every Main Street event. Doug and his Zachary’s crew are willing to step up and do whatever is needed to ensure that the great city of Columbus is a better place for all of us to live. Accepting: Mayor Maxwell - Leadership involves establishing a clear vision, sharing that vision with others so they willingly follow, providing information, knowledge, and methods to realize that vision, coordinating, and balancing the conflicting interest of all members/stakeholders. This definition sums up Pascagoula’s Mayor, Dane Maxwell. Leadership is running through his veins. He knows what a true visionary is, understands the big picture, networks easily, always sells the vision, knows people are key, listens to advisers, leads with a common sense approach, and people respond with remarkable results! First on Mayor Maxwell’s agenda was forming a partnership with Main Street to move Pascagoula forward. Ask him why and he says, “It’s simple; you guys already have the wheelhouse and the expertise to get the job done. It’s a no brainer.” Pascagoula Main Street is blessed to have Mayor Dane Maxwell, a passionate leader, always busy making a difference ALL DAY, EVERYDAY to move Pascagoula forward. Due to the commitment, time and enthusiasm that Paul Coggin brought to the Mississippi Main Street Association, a special award was established in his honor, given to an outstanding local board member or volunteer who has been active in a downtown organization for a significant period of time, and who has contributed energy and dedication to downtown revitalization. Dr. David L. Beckley is the current President of Rust College in Holly Springs. He is the longest tenured senior college President in Mississippi and is the 11th President of this Historic Black College. He graduated from Rust College in 1967 and holds a bachelor’s Degree, M.Ed. and Ph.D. in Higher Education from the University of Mississippi. He is also a 2010 graduate of the FBI Citizen’s Academy. In 2007, under Dr. Beckley’s direction, Rust College began the process of bringing Main Street to Holly Springs. Rust College was the financial contributing partner for Holly Spring Main Street’s first three years. Dr. Beckley saw the benefits of becoming a Main Street Program and has served on the Board of Directors, including 2 terms as President, from 2010-2017. Dr. Beckley has given of his time, including the use of his home for Main Street Chamber events and sponsoring monthly Board meeting breakfasts during his tenure as President. More importantly, he has brought community leaders and members on board through leading by example and cultivating the relationships required to ensure the success of Holly Springs Main Street. Dr. Beckley’s dedication, enthusiasm and commitment to Main Street and Holly Springs for the past 20 years is a true representation of his character and makes him an excellent recipient for the Main Street Trailblazer Award. Merchant of the Year- This award recognizes one outstanding local business owner who has a flourishing and innovative business and displayed an involved commitment to downtown and his or her Main Street program. Lott Furniture Co. is Laurel’s oldest business. They have over a century of history in our small town and a plan to stick around another hundred years. Rodney Rowell and his wife Angie believe that their business is more than just a means to an end; they believe that it is a resource for them to put down roots and live in a community of people united toward a common goal. The business is most certainly a family affair. Rodney’s mother worked there for over 50 years, and he and Angie met at Lott when she started working there as well. The Lott team has taken Mr. Lott’s original business model and adapted it for young people who are moving to Laurel, and they are dedicated to being tireless advocates for their town. Laurel Main Street hopes we never have to know a Downtown Laurel without Lott Furniture! Outstanding Main Street Director of the Year & Charles Beasley Scholarship Award- Charlie Beasley was one of the founding members of MMSA and served on the Board and in various officer positions, including President. He was Board Member Emeritus at the time of his passing in 2007 and had served Main Street since its inception in 1989. This award is a $1,500 scholarship to attend the National Main Streets Conference, given to a Main Street Director who has shown outstanding service to his or her community and Main Street program. The scholarship is awarded annually, and the MMSA Staff and Board select the recipient. Biloxi Main Street has been a MS Main Street community since 1991. Kay Miller has led the Biloxi Main Street organization for the past 15 years. Kay is the Downtown Services Manager and Main Street Director for the City of Biloxi. A seasoned Main Street Director, Kay has overseen Biloxi Main Street through the most challenging period of Biloxi's history - through Hurricane Katrina and its aftermath, the economic downturn and the BP oil spill. Some of Kay’s accomplishments include saving and restoring the 108-year-old Bond-Grant House; the implementation of the downtown façade and landscaping grant project; the incubation of Gallery 782 (a 40-artist co-op), the creation of Grillin’ On The Green festival, and the downtown Farmers Market Festival series. Kay is a 2014 recipient of an Excellence in Main Street Scholarship from the Mississippi Main Street Association. Kay has served as a Past Director’s Representative on the MMSA Board of Directors and is a frequent presenter at Main Street conferences where she helps teach and guide newer directors in successful practices in downtown revitalization and community events and projects. Kay was recently featured in Mississippi Magazine’s “Talk of the Town” for her work with Biloxi Main Street. Kay is dedicated to ensuring a prosperous Biloxi. Her role in economic development centers around building relationships within the community and through preserving, revitalizing and promoting growth within the downtown Biloxi area. This includes identifying and drawing in businesses that benefit the commercial needs of the community as well as attracting residents and tourists. From boutique clothing and specialty shops to signature restaurants and art galleries, Kay makes sure there is something to suit every taste. One of Kay’s favorite events is Biloxi Main Street’s Volunteer Celebration that is hosted every year in April. It is a way for Kay to thank the many volunteers who serve each year with Biloxi Main Street. Kay has lived on the Mississippi Gulf Coast for nearly 30 years. She’s raised two children and dedicated much of her time to promoting Biloxi as a beautiful place to live, work and visit. Congratulations, Kay, on being named the Outstanding Main Street Director of the Year! View photos of 2017 Annual Awards Meeting. Outstanding Community Education Campaign – This award recognizes excellence in a targeted campaign that educates the community about a streamlined effort to raise awareness on a particular aspect of a Main Street program. The Bicycle Sculpture Project began in July 2015 as a community campaign to produce sculptures of taste that related to our community and the growing awareness of being a healthy community by welcoming bicycles as a form of art. The newly formed Pontotoc Artist Guild set the plan in motion to create the whimsical, colorful, and interesting pieces. Selling the acceptance of bicycles in our communities became a major task. The Artist Guild wanted to help promote a healthy climate in our communities as well as the use for the trail. Helping educate our citizens on the effects of being healthy and using the trail, as well as added an artistic flavor to our community has given a spark to the Main Street district. The attractive art pieces have been a catalyst for other additions, including Mini Libraries on the Trail and bird watching spots. Outstanding Creative Fundraiser – This award is granted to the downtown organization that has displayed the most creativity and success in securing funds for its downtown program or specific project. One city's trash is another person's sentimental treasure. So, West Point Pickers was created. Instead of throwing away old street signs or infinitely storing retired Christmas decorations, West Point Main Street coordinated a fundraiser to sell the surplus items and raise money for future downtown projects. Residents and collectors bid on popular street signs, purchased old Prairie Arts Festival posters, and revived Christmas decorations that hung on street poles they remembered as a kid. A live auction entertained the buyers as well as motivated them to give more to their community. Partnering with local businesses to sample Mississippi craft beer and taste local fare, attendees left nostalgic of the past and excited about the future projects in downtown West Point. Outstanding Marketing – This award recognizes excellence in overall marketing by a downtown organization through its integrated communications efforts, including traditional and digital marketing. Ocean Springs Main Street brands itself as a creative community with a walkable downtown, numerous festivals, and hundreds of shops, restaurants and galleries that showcase the attributes of this coastal, artsy community. Through the organization’s marketing collateral, Ocean Springs Main Street, Chamber of Commerce and Tourism Bureau tell the story of one of the oldest towns on the Gulf Coast. The collateral includes a comprehensive town tourism guide, downtown walking map, website and social media outlets - all proven successful to bring in nearly 500,000 visitors to the small town with a population of 17,500 and obtain numerous town awards and mentions including “One of the Top 10 Coolest Small Towns” by Budget Travel, “One of the South’s Best Small Towns” by Southern Living Magazine and “One of 7 Waterfront Towns Worth a Closer Look” by CNN. Premier Partner – recognizes creative joint ventures between the Main Street organization and another local, community entity or entities (public or private). When people come to the delta, they expect to hear live music. Unfortunately, regular live music is often hard to come by in Cleveland. On the flip side, the Delta Music Institute at Delta State University has an abundance of musical talent who are looking for venues in which to perform. In the fall of 2016, representatives from the DMI, Team Cleveland Main Street, and Keep Cleveland Boring came up with an idea to partner and kill two birds with one stone. The group developed an initiative called Wired for Sound, which put DMI student musicians in local restaurants 2-3 nights a week for 10 weeks. Using money raised during their restaurant week promotion in January, Keep Cleveland Boring and Team Cleveland Main Street were able to pay for half the cost of live music. For only $25 a night, local restaurants were able to have weekly live music. (1 of 2) Outstanding Creative Event – This award recognizes the downtown organization that has created a quality creative event, generating traffic for the downtown. 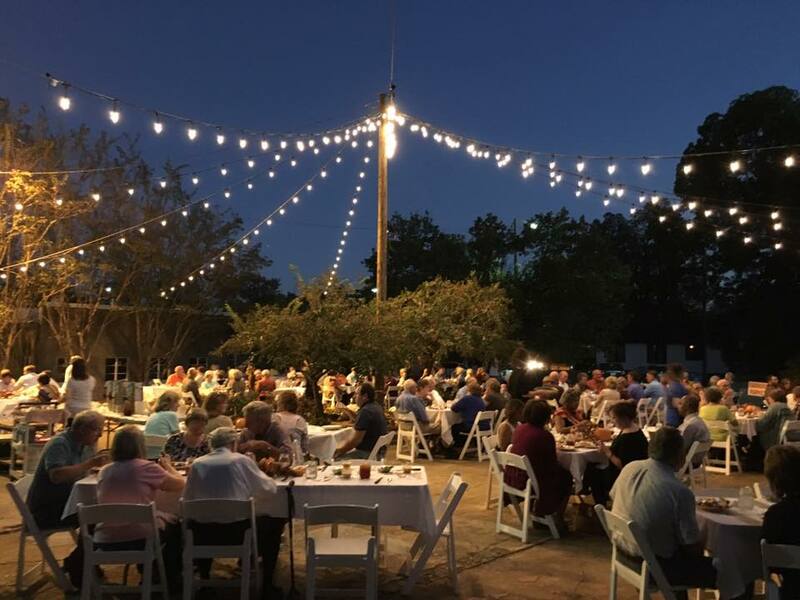 Home Grown: A Farm to Table Dinner was held on the quaint brick streets of Olde Towne as a kickoff to the Fresh at Five Farmers Market season. Home Grown featured crops from local growers in delicious, creative dishes by Clinton chefs. The first-time event raised over $4,000 for the program and gave great exposure to local chefs and the farmers market. The menu was crafted to highlight the flavor and versatility of fresh produce and showcase each chef’s specialty. Home Grown was held underneath a tent strung with lights, an abundance of greenery and produce for décor, and a vintage truck for added flair. Live music continued through the night as attendees enjoyed this three-course meal in the heart of the community. Home Grown was sponsored by Blue Cross and Blue Shield of Mississippi, a local partner with a commitment to supporting local growers and healthy eating habits. Under festive lights with local musicians providing a live soundtrack, the inaugural Starkville Night Market combined urban street vibes and county fair charm. The first 2016 New South Weekends event made the weekend complete for tourists and residents, featuring the best of Starkville’s creative economy in the heart of Main Street. Chefs offered culinary bites with specialty cocktails, and local artists, retailers and vendors offered an extensive range of art, fashion, décor, gifts and food. Night Market created an economic impact driving commerce to local merchants, resulting in increased sales tax collections and provided new artists and merchants a venue to introduce themselves. The event offered a glimpse into the Main Street nightlife, seeing attendees furthering their dining experience at nearby restaurants. New South Weekends celebrates the vibrant and thriving creative culture in Starkville. The Night Market was a perfect venue to showcase that culture to the world. Outstanding Image Promotion – This award recognizes the downtown organization or business that has developed an effective public relations piece or specific promotional campaign. Following the master planning charrette that was hosted by Mississippi Main Street, Team Cleveland Main Street began work on a branding campaign that encouraged shopping local. The plan included adding banners downtown and on streets that connect Hwy 61 and DSU to downtown. In total, 68 banners have been installed. Additionally, the Team Cleveland design committee and Cleveland Heritage Commission worked with MDOT for nearly 3 years to install a system of wayfinding and public parking signs in Cleveland. The signs direct passersby off the busy highways and toward our downtown area. Also, the Team Cleveland organization committee developed a ‘Shopping & Dining Guide’ that provides a description of every downtown retailer. More than 10,000 guides have been provided to visitors so far. In total, Team Cleveland has spent $63,440.45 in privately raised money on this project. Not $1 of City funding has been provided for this endeavor. Main Street wanted to ensure that one did not forget about its cultural diversity as well. To unify history, diversity, and beautification, our design committee found a way to branch these three key foundations together that would brand Columbus Main Street and also provide eye-catching designs and details to our downtown businesses. Our design committee added customized window clings that would hang from the display windows of downtown buildings. The locals of Columbus believe that our cultural diversity is the strength and heartbeat of our small town and what keeps us grounded and close. Columbus’ diverse composition makes us the unique gems that we are, and the downtown window promotion puts that on display. Outstanding Retail Promotion – This award honors the downtown organization that has developed an effective retail promotion(s) in conjunction with downtown merchants. In an effort to promote local holiday shopping among downtown merchants, Rosie Knop, owner of Playpen Kids & Maternity store, volunteered to be the American Express Neighborhood Champion in partnership with Hattiesburg Downtown Association, in order to organize and initiate the Shop Small Saturday holiday shopping weekend event. Rosie Knop along with HHDA social media manager, Keenon Walker, ordered and distributed promotional materials to all merchants, including doormats, canvas shopping bags, stickers, balloons, pins, paper crowns, as well as other Shop Small logo items. Each merchant was also given a small tutorial on how to create free online ads for their websites and business Facebook pages. Keenon created a successful social media, print, and newsletter campaign to promote the event. Playpen Kids & Maternity created a map with each merchant that continues to be updated and given out to customers in various locations in downtown. Additionally, the merchants joined forces to do a downtown wide scavenger hunt. Outstanding Rehabilitation Project – This award is granted to an individual or business that has completed an outstanding historic rehabilitation project that continues the use of the building. The restoration and re-location of the Historic Mantee Depot has been a catalyst to boost development and restoration in this small town of less than 250 people. The depot was relocated close to its original location after sitting on private property for many years. The exterior non-original asbestos and Masonite siding was removed and the original board siding was restored. A new roof was installed along with new wood windows and original freight doors. The ticket area was rebuilt using new and old studs, the freight room was realigned, and ADA access was provided. The City has found new use for the Depot as a Community Room, City Hall offices and a Museum. Resurrecting the landmark, Mantee Depot has provided a platform for “new things to start happening” as the tiny little town of Mantee looks forward to tomorrow’s growth. Outstanding Visual Merchandising – This award recognizes excellence in visual merchandising in a retail business in a Main Street district. Haley moved into a historic 6,400 square foot building, which formerly housed Kamien’s department store. By moving into the larger space, Haley was able to once again provide a department store in Cleveland. The added room allowed her to triple the size of her inventory while also adding shoes, gifts, and cosmetics. To make the much-needed improvements to her new building, Haley and her handy husband Eric worked with Mississippi Main Street for design services. Eric and his crew renovated the building, which included a total overhaul due to termite and water damage. H Squared now features whitewashed hardwood floors, chandeliers everywhere, marble countertops, and unique furnishings to provide a big city feel in downtown Cleveland. H Squared also features a pink MG convertible that helps to display merchandise. Outstanding Public Improvement Project – This award is given to the municipality or Main Street program that has designed and implemented attractive and sympathetic improvements for its district. In order to develop the Gateway project, a partnership of public and private funds was very necessary. The City owns 10 acres of land connected to the Tanglefoot Trail that goes through the downtown area. Mayor Stafford took the plans to establish a gateway on the trail that would serve as an attractive place to rest, start exercising, and functional stopping area. Working in conjunction with the administration of the Trail, local architect, and private donors, the plans were set in motion. In February of 2016, local investors: 1st Choice Bank, Southern Motion, Archives and History, a private donor, and city employees broke ground on the project. Six months later a grand opening was planned for the 1st Choice Bank Gateway. This project is an ongoing one that has visitors, downtown merchants and customers singing the praises of the Trail. Improvements are still being made, such as the addition of a fountain added to the water feature paid for by a private donor. In 2013, the old Laurel WAML radio station photos were displayed at a MMSA meeting on design. A re-use project idea for this building stumped the panel and we were all pretty confident that in reality the best option was demolition. Then came not only the idea of a microbrewery in downtown Laurel, but also the creative vision of Kenny and Carrie Mann. The large, ugly building underwent months of repairs. The paint was applied and Slowboat Brewing Company was born! The conversion of this property has allowed a new business to become a thriving success and a welcome addition for places to go and things to do in downtown Laurel. Outstanding Economic Impact – granted to an individual, business or municipality (or partnership of entities) that has undertaken a new development project within a downtown district. Bargains galore and community rapport happens the first Saturday of the month in downtown Kosciusko in a city owned parking lot. Pickers and sellers come together for one big yard sale to barter and banter over one of a kind items. This event started in August 2016 with 15 vendors and slowly continued to grow through November, took a break and resumed in March 2017 with 30 vendors and shoppers waiting for 7 AM to view the merchandise. Our downtown merchants have even gotten into this event by placing sale racks and tables in front of their stores. This event actually morphed into Picking 35, a 50-mile yard sale in conjunction with Attala and Leake counties that took place in April 2017. (1 of 2) Outstanding New Business – granted to a new business in a downtown district that contributes to excellence in downtown revitalization. Inspired by the pub atmosphere in Nashville, Roy Windham, owner/operator of the Porter Public House, wanted to bring that experience to downtown Hattiesburg. He wanted to create a space that was truly an extension of the downtown community and where people felt at home. In an effort to build interaction and engagement between its patrons and the community, the Porter hosts regular events hosted by local organizations like Extra Table, The Spectrum Center, and Pine Belt Young Professionals. They also host regular events like Trivia Tuesday, monthly beer-pairing dinners, and stand-up comedy nights. Roy’s desire to be an active participant in revitalizing downtown has manifested itself in a renewal of nightlife energy. Since the Porter's opening, more businesses have sought to open in downtown, such as the Black Sheep’s Cafe & Speakeasy and the Blue Jazz Cafe. Roy plans to combine efforts with more businesses downtown and make Downtown Hattiesburg a real travel destination. The Thirsty Devil has changed the energy of downtown Tupelo. Seth Renick and Matt Peay, a former welder and biological science technician, noticed the lack in nightlife and decided to take matters into their own hands. In October 2016, Seth and Matt arrived on the scene with an entrepreneurial ferocity, delicious eats and mean drinks to share with an impatient, hungry audience. The Thirsty Devil has been a catalyst for nightlife ever since, changing the pace of downtown “after hours” since its opening. During lunch hours, two couches take over the stage, making it a great hangout spot. At night, those couches are moved outside to the sidewalk to make room for bands to play, creating an organic Placemaking area in downtown Tupelo. The Thirsty Devil maintains a close friendship with Tupelo Main Street program by eagerly involving their business whenever and wherever help is needed. The Thirsty Devil has made a large impact in its short time in downtown Tupelo. “Innovation on Main Street” Award – The National Innovation Award recognizes Main Street America programs for successful, sustainable initiatives that represent new approaches to an existing downtown revitalization challenge or opportunity. Awards were announced as part of the Main Street Now Conference in Pittsburgh, Pennsylvania on May 3, 2017. The Fishbone Alley “Urban Living Room” project in an inspiring example of the power of Main Street to transform downtowns and rally communities. Gulfport Main Street Association helped to turn an underused, unattractive alley right in the middle of the downtown district into a vibrant public space, featuring century-old brick pavers, public art, and enchanting lighting. The grand opening in 2016 drew thousands of locals and visitors alike who wanted to experience the essence of this “urban living room” – a space unlike any other on the Gulf Coast or the state of Mississippi. Only four Main Street programs received awards at the national conference that drew approximately 1,600 attendees representing 45 states and 1,600 Main Street programs. (1 of 2) Outstanding Community Transformation – This is an overall award that goes to a Main Street program that has achieved a successful, preservation-based downtown revival. The City of Batesville began an extensive streetscape project in downtown Batesville in 2015. The project took place over a two-year period and was carried out in two phases. Phase one included new LED lights, ADA compliant sidewalks and parking, new crosswalks and the addition of green space. During this phase, many existing utility lines were placed underground dramatically changing the look of the downtown area. Phase two included realignment of Eureka Street, the addition of ADA compliant sidewalks, reconfiguring parking areas, additional landscaped areas and raised crosswalk. This phase also included the transformation of a vacant corner lot into a usable public space. The project has positively impacted the economic climate downtown and brought a renewed sense of community pride for the downtown area. The streetscape enhancements, along with downtown façade rehabilitations, a gateway pocket park and energy from new businesses have also contributed to the beautiful facelift of the historic Batesville Square. The Elvis Presley Birthplace Trail connects downtown Tupelo to East Tupelo and the Elvis Presley Birthplace. The $11.5 million-project was funded by the City of Tupelo’s Major Thoroughfare Program, and a $2.3 million transportation enhancement grant was awarded by the Mississippi Department of Transportation. The project took 11 years to complete and was finished in August of 2016. The trail connects two of Tupelo’s greatest historical landmarks—the Birthplace of Elvis Presley and Historic downtown Tupelo and improves traffic flow and efficiency as well as pedestrian comfort and safety. Enhancements included repaving and widening East Main Street to five lanes, synchronized traffic signal controls, street trees and green space, sidewalks with bricked pedestrian crosswalks, crossing signals, and decorative street lighting. Another goal of The Elvis Presley Birthplace Trail is to enhance the commerce, community, and tourism experience of Main Street, as well as to promote the economic development projects that run along the route. The Downtown Tupelo Main Street Association, the City of Tupelo, the Community Development Foundation, and the Mississippi Department of Transportation spent years of planning to make this project possible. Main Street Excellence in Design – in memory of Sam Kaye - Sam was an architect and community leader who served MMSA as a staff member and design consultant from 1994 until his passing in 2013. As a member of the Board of Advisors of the National Trust for Historic Preservation, Sam’s involvement in historic preservation was nationally known and recognized. The Sam Kaye Excellence in Design Award is given to the design professional(s) or firm that exhibits the spirit, compassion and talent of the man for whom the award is named. Angela Clanton joined the Batesville Main Street Design Committee in 2010. The owner of ILLUS Visual and Design Arts, Angela has volunteered countless hours to improving the appearance, functionality and safety of Batesville’s downtown area. Façade rehabilitations, an extensive streetscape project, Polar Express preparations, building signage and an improved entrance to the downtown are all areas that Angela has contributed her knowledge and talents to. Angela has also served as a liaison to the City of Batesville in regards to public improvement projects in the downtown area. As a direct result of Angela’s design work and enthusiasm for downtown revitalization, the downtown has seen an increase in private and public investment. Her efforts have made downtown Batesville more inviting to visitors and residents. (1 of 7) Main Street Hero – This award recognizes one outstanding community leader or public figure who has displayed an involved commitment to downtown and his or her Main Street program. A Mississippi Treasure is one description we use to promote our town, but within this town we have a hidden treasure in Mr. Sam Jaynes. Our treasure is a 90 year old that has a 70-year background in civil engineering, and like the Energizer Bunny, he keeps on giving. He has been a Main Street member since Aberdeen Main Street began in 1993. With a grant from ARC, Aberdeen Main Street is renovating an old depot to be used as a cannery and education center. Most all of the help has been from inmate labor from the Monroe County Work Center, and Mr. Sam goes daily to oversee, instruct, and advise those working. Completion of this project will benefit our community for years to come and it would not have been possible without Mr. Sam! Edwina (EDWIN-a) Williams, who is known by all of the locals in Columbus, MS as “Mother Goose”, has portrayed this very character for over 30 years, and she is just as excited about it today as she was the first time she took on the role. Mother Goose faithfully reads to children at the Columbus-Lowndes Public Library, and without reservation or hesitation, she appears and volunteers at every event and activity held in the downtown Columbus community. Edwina Williams is an extraordinary woman and a pillar within our community and is easily the city’s most recognizable citizen and a key asset to Columbus. Jeff Baldock isn’t a community leader or a public figure but what he has been doing since his retirement makes him a Main Street Hero. In 2014, Jeff retired from First Chemical in Pascagoula where he had worked 29+ years. Jeff considers himself an amateur photographer. He had taken some pictures of local downtowns and received great feedback on Facebook. He took to the road to take pictures of Main Street downtowns all across the state of Mississippi. Jeff has photographed almost 75 percent of Mississippi’s downtowns and is working towards completing the rest in the near future. Most of Jeff’s work is at nighttime when there is stillness and no one in site so he can catch the beauty of the downtown. If Jeff hasn’t been to your downtown, you can bet that he will be soon. Jeff does all of our downtowns proud! Dr. Miriam Clark is an outstanding community leader who has been one of the Best Cheerleaders for our downtown Main Street Program since Pontotoc Main Street’s start in 2007. After retirement, Dr. Clark has been working on her second career in retail sales. A very creative and energetic individual in the Antique Business with three other ladies, Dr. Clark spends her time making customers feel welcome and at home in Pontotoc. Dr. Clark’s store, Antiques Downtown, along with her brother’s store of Antiques on Main, helps the growing enthusiasm of the antique businesses in Pontotoc. Dr. Clark is a member of the Pontotoc Art Guild that has provided art sculptures to our Main Street Area. She is always seeing the bigger picture, knowing what is good for Antiques Downtown is good for all of Downtown. Not only does Dr. Clark work on Main Street, she lives on Main Street and is an integral part of the positive growth of downtown Pontotoc. Mary Ayers has been a leader in the Senatobia Main Street program since day one of its rebirth in 2013. Her tireless efforts to improve the community have often been done with little to no recognition. Her servant attitude has helped Main Street grow more than most will ever realize. Her willingness to serve and her love of Senatobia are what make Mary a role model for all those in the business community. Downtown Tupelo has come a long way in the 27 years since our program started in 1990. This resurgence can be attributed to, in large part, the Reed family. Before there was a Downtown Tupelo Main Street Association, there was the Uptown Merchants Association, lead by President Jack Reed Jr., grandson to the founder of the Reed’s Department Store that opened in 1905. Under the direction of the Reed family, the Uptown Merchants Association became the Downtown Tupelo Main Street Association, and from there the downtown revival of Tupelo began. Because of the groundwork the Reed family laid, along with their continued support of the Main Street Initiative, they are Downtown Tupelo’s Main Street Heroes. When it comes to involvement and commitment to success in downtown Vicksburg, Laura Beth Strickland has made her mark! From lending a hand in planning and being somewhere at the crack of dawn to doing whatever needs to be done for an event, she is there. Laura Beth is the Deputy Director of the Vicksburg Convention & Visitors Bureau. She has shown exemplary leadership and commitment to downtown Vicksburg and the Main Street Program. Main Street Trailblazer – Award in memory of Paul Coggin - Due to the commitment, time and enthusiasm that Paul Coggin brought to the Mississippi Main Street Association, a special award was established in his honor, given to an outstanding local board member or volunteer who has been active in a downtown organization for at least the last two years, and who has contributed energy and dedication to downtown revitalization. Kristen Stevens has a passion for downtowns. Her work reviving downtown West Point over the past 20 years has made an impression that inspires others to follow her lead. She hasn't volunteered her time and talent by merely attending committee meetings with ideas and suggestions. She has rolled up her sleeves and invested in her own downtown during a time when urban sprawl was rising. She completed two residential and four commercial restoration projects, coordinated numerous beautification efforts, and held various positions on the board. Kristen understands the importance of partnerships and buying local at every opportunity. Currently serving as West Point Main Street President, Kristen Stevens continuously energizes one of the oldest Main Street communities in the state of Mississippi today. Outstanding Main Street Director of the Year & Charles Beasley Scholarship Award - Charlie Beasley was one of the founding members of MMSA and served on the Board and in various officer positions, including President. He was Board Member Emeritus at the time of his passing in 2007 and had served Main Street since its inception in 1989. This award is a $1,500 scholarship to attend the National Main Streets Conference, given to a Main Street Director who has shown outstanding service to his or her community and Main Street program. The scholarship is awarded annually, and the MMSA Staff and Board select the recipient. A native of Clinton, Miss., Tara was hired in 2007 as the first director of the Main Street Clinton program, which is celebrating its 10th anniversary this year. Tara holds two degrees from Mississippi College, a bachelor’s degree in Interior Design and a master’s in Public Relations. Tara has directed the Main Street Clinton program with steady leadership, careful planning, many dedicated volunteers and partners, including the City of Clinton and Mississippi College, and the passion and enthusiasm that is a MUST in Main Street work. Tara may seem quiet and unassuming but her work ethic is fearless and pretty much flawless. From the fabulous email marketing of Olde Towne Clinton’s monthly events and Farmers Markets to the impressive execution of every event and project. Tara is also visionary – working hard with her board to recruit new businesses and restaurants to Olde Towne and even moving out of the Main Street office in Olde Towne to City Hall to recruit another restaurant to Olde Towne. The Olde Towne district continues to grow with appropriate new construction and mixed-use buildings. New plans and projects are always on the table! Tara uses interns to help with the ever-growing work, and was able to hire her first full-time assistant, Anna Boyd Hawks, four years ago. Civically, Tara has been involved in numerous organizations in the community. She is currently serving in her second term on the Chamber of Commerce Board of Directors, she is a graduate of the Chamber’s Leadership Clinton Class of 1999, and she has served as President of both The Arts Council of Clinton and Junior Civic League. Not only does she serve her community well, but Tara has been a wise sounding board for other local Main Street directors and has been an asset to the MMSA staff and board as well. She is quick to share resources (like Clinton’s award-winning business recruitment packet) with other directors, and she keeps Main Street Clinton in excellent standing by attaining state certification and national accreditation annually. With the help of many volunteers, Tara has guided the Main Street Clinton program to now 20 state awards for accomplishments in the Main Street districts and has received a personal award for Excellence in Main Street. Tara was elected by her Main Street director peers earlier this year to serve as a representative on the state Main Street board. We appreciate her service to the state program. Through her hard work, dedication, exceptional taste and love of her community, Tara is Mississippi Main Street’s Outstanding Director of the Year and recipient of the Charles Beasley Scholarship to attend the 2018 National Main Street Now Conference in Kansas City, MO. Congratulations, Tara!